Supports curriculum in life science and geography at multiple grade levels. Quench your thirst for knowledge with The Digital Field Trip to The Desert. Let us transport you to five North American desert locations using QuickTime Virtual Reality. Visit the surprisingly lush, green Sonoran Desert, the brightly colored landscape of the Painted Desert and the Cattail Falls oasis in Big Bend National Park. Explore the barren landscape of the Black Rock Desert or experience the blinding glare and oppressive heat of Death Valleywithout the heat stroke. Discover what makes a desert a desert. Learn about all of the world's major desert regions, including pictures collected from all over the planet. See the processes that formed and shape the deserts. Topics include: rocks and minerals, how wind and water can affect the landscape, weathering and a landforms quiz. The Desert Study includes an extensive section on the ways desert plants and animals are adapted to survive the challenges of living in arid regions. 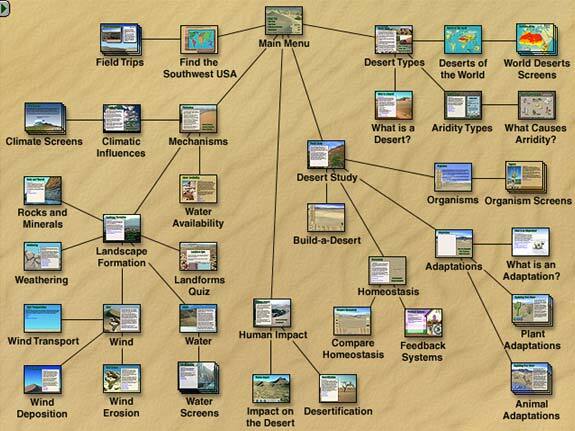 You can also create your own desert ecosystem in the Build-a-Desert game using the more than 50 organisms featured in The Digital Field Trip to The Desert. Also in this section is a primer on homeostasis. Student and teacher materials are included with the program, allowing you to print just what you need, when you need it. The workbook materials act as an excellent study guide, leading students through the program with tips, suggestions and quizzes. The accompanying teacher's guide includes answers, as well as teaching suggestions and even offers graphic resources for K-3 activities. The Digital Field Trip to The Desert runs on both Macintosh and Windows platforms. All this can be yours for as low as $84 (school licensing) or $60 (home licensing). Multiseat pricing is available, to find out more check out our full price list.